She's alive! She's alive! No, I have not been abducted by aliens or joined a weird goat-worshipping cult. Although I do adore goats! Hmm, perhaps I should start a weird goat-worshipping cult. Anybody want to join? Anyway, I've been feeling quite uninspired lately and I just haven't had the energy to do much at all. I really wanted to have a birthday post, so I've been working on this post for a few days typing a little bit here and there. Timex Marathon. Isn't it the coolest watch ever? My next present was a gift from me. I bought myself the Lost in Austen DVDs. Ever heard of it? It's a four-episode TV show about a modern-day woman that swaps places with Elizabeth Bennett. Lost in Austen DVDs and all of my Jane Austen books. If you are a Jane Austen and Pride and Prejudice fan you will LOVE this show! Unless you're an Austen purist, then who knows. You might hate it. The show is about a woman living in today's London, who is obsessed with Pride and Prejudice and very disillusioned with real life and its lack of romance. Amanda Price finds Elizabeth Bennett in her bathroom, who shows her a door that will lead her into the Bennett's house, and into the story of Pride and Prejudice where she will be stuck. Amanda arrives just at the beginning of the story and she tries to make sure that everything that is supposed to happen, happens according to the book. Of course her mere presence changes everything and nothing seems to be like it should. Meanwhile, Elizabeth is stuck in modern London (we don't see much of her), so what is Amanda to do to get her and Darcy to fall in love? The characters are exquisite! Amanda is very Bridget Jones-ish and charming as could be. The actress (Jemima Rooper) was well cast and she is extremely lovable. If Darcy appeared rude and rigid in the book, then prepare yourself for something very dreadful. This Mr. Cranky Pants is even more insufferable! Yes, there is "the water scene." Jane is lovely, and her story is greatly affected by Amanda's presence. Lydia is not the annoying little brat that she is in the book. She is actually very sweet. Kitty and Mary are not a big part of the story, but the girls are adorable. Mr. Bennett (Hugh Bonneville) is Amanda's ally, but Mrs. Bennett (Alex Kingston!!!) is not her biggest fan. Bingley is quite the bimbo, and the interactions between him and Amanda are hilarious. During one of their conversations there is a subtle reference to Jane Austen's "Emma", which you will definitely notice it if you have read that book. Miss Bingley is delightfully arrogant, and let's just say that she will reveal something quite surprising about herself. Lady Catherine de Bourgh is not so evil. She won't win the Miss Congeniality award any time soon, but she is definitely less rigid and more interesting. Mr. Wickham steals the show! He is far less evil and much more mischievous than his book-self. Georgiana Darcy's story will surprise you. There are people who didn't enjoy this show but I certainly wasn't one of them. Apparently they are now making a Lost in Austen movie directed by Sam Mendez. If I had the energy, I would do a celebratory cartwheel right now. Well, I don't know how to do cartwheels but I would at least try! The next present is also something I bought myself: it's Veganomicon! No, I did not have it. The first recipe I made? Chocolate cookies, of course! 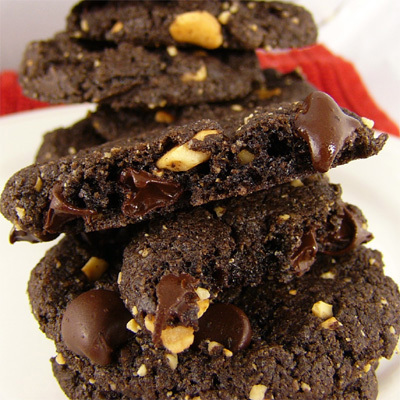 Chocolate-chocolate chip walnut cookies with cashews. 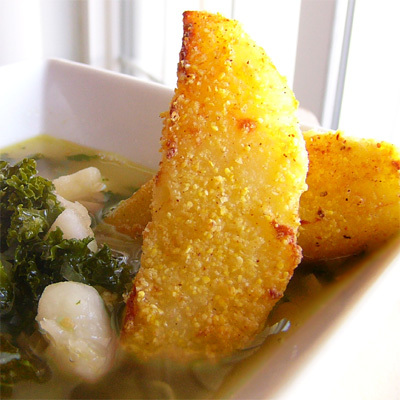 Baked potato and greens soup with potato-wedge croutons. All soups should have a potato-wedge crouton stuck in them. Or two, like mine here. Not from Veganomicon but one of our meals from last week that I really want to mention - Jessy's butter bean burgers. We had them breaded and topped with goodies and they were fantastic. Jessy is the Butter Bean Queen! So, there you have it. This was a really good birthday and I'm even OK with not being in my 20s anymore. I can live with the couple of gray hairs (this means four) that have grown right in the middle of the top of my head. Happy! Happy! Day!! So much wonderfulness here that I don't know where to start. Well, Ok. I'll have one of those V'con choco-choco-cashew cookies. :-) The DVDs sounds deeeeelightful. Enjoy ever second over and over again! Hugs and smooches to you this special day! Happy Birthday from a lurker! Could you tell me where you ordered Lost in Austen? That sounds straight up my friend's alley (and mine), so I'd love to be able to get it for her. Thank you! Happy happy happy happy birthday!!!!! I'm sorry that you have been so fatigued and I hope you start feeling better soon. The watch is such a sweet gift, and those cookies look like a chocolate-lover's dream! Enjoy your dvd and box of goodies and get better! Happy birthday River and all the best for a wonderful year! The chocolate walnut cookies were my first recipe out of Veganomicon too!! I'm looking forward to checking out this movie (movie, show? )..what girl wouldn't want to trade places with Elizabeth Bennett? Tee hee!! Luckily, you quelled my fear that the shirtless Mr. Darcy scene would be missing..he he! My squirrels say they would have baked you a nutcake if they had known but instead they just say "happy birthday and may this be your best year yet!!" i think that dvd series looks great! congrats on pickin up the vcon! life is about to improve!! happy birthday, river! i really hope you gather the energy to feel better soon! Happy Birthday!! I hope you feel better soon, I am so up for joining a goat adoring cult hehe, they are cute! Btw, your v'con cookies look scrumptious! Happy happy birthday to one of my favorite bloggers! Happy happy birthday! It looks like you celebrated in style. I love the DVD set you bought. Being a Jane Austen love myself, I will try to find these too. It sounds like a good show. Happy Birthday! I have the same watch- but mine is purple and black and that timer is handy :-) Also I now want those cookies from vcon.. 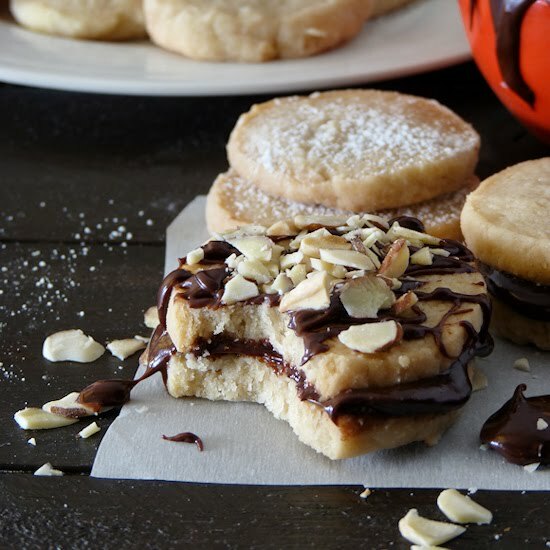 I made them for my husband and he thought they were the best cookies ever! There is too much amazingness going on in this post! The cookies (hell yes for v'con! ), the cards (adorable wabbits), and the delightful gift from VeggieGirl. You deserve it all girl! Happy belated birthday River!!! I hope you are feeling better soon. Enjoy your new cookbook, there are so many yummy recipes in there. You will love it. Oh My Sweet River-of-Birthdayness! I'm so sorry, I didn't know you were feeling icky. I hope you get it all worked out soon! You got the best birthday loot ever! You're a lucky girl, but you also totally deserve it! 30 was a great year for me, I was married, and a few months later, pg with Guppy. Good year. I am in total DVD and watch ENVY! Seriously. I so want those DVDS! Happy belated birthday River!!! Looks like we are both trying to rejoin the blogosphere. Looks like your day was a pretty special one. Hope you start feeling much better!! Happy Birthday!! I'm sorry your energy isn't where it should be. But what an awesome day with so many nice wishes. Take care and enjoy your presents. happy birthday, river! i'm sorry you're feeling so tired lately... hopefully cutting out the soy will help. and i'm glad you had so many awesome nice things and people to cheer you up for your bday fun! 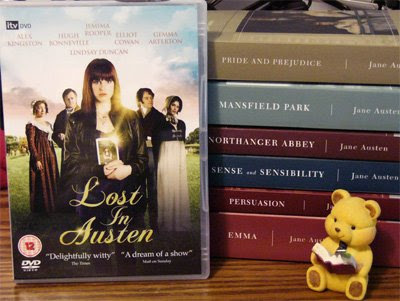 Thanks for the info about the Lost in Austen DVD! I loves me some Jane! I bought a fabulous book this summer called Lost in Austen (create your own Jane Austen adventure). It's like those mystery books where you get to choose where to go next. So characters from one story end up in another! It's really fabulous to read over and over and it's always different! (Author is Emma Campbell Webster). I hope you're feeling better soon and I'm glad you had such a fun birthday (even while sicky). those chocolate cookies could convince me to buy v-con in about two seconds. yum! HAPPPY BIRTHDAY MY SWEET RIVVY! hahaha you deserve the words and the entire post!! ohhhh I am so glad that it's such a special day for you...and i feel all the love...all of us love you dearly! another great post from ya! And I haven't bought Veganomicon yet either. HAPPY BIRTHDAY! I'm super jealous of your Lost in Austin. I've just had a JA marathon. Colin Firth P&P, the new Sense and Sensibility, and now the Kate Winslet Emma. Hope you're having a great b'day weekend! Yay for veganomicon! I totally love that cookbook. And super yay for birthday cookies. Happy Birthday River! I hope you had a great day!!! happy brithday, River! sorry i missed the actual day. i hope you had the most glorious day! cutting out soy may help with fatigue - i hope it's not thyroid stuff. i will send you happy thoughts and keep my fingers crossed for you too, River! that's one fantastical watch - i super love it! mr wing-it = the best! oh my gosh - hooray for veganomicon! it's so great! the kale-potato enchiladas are one of my favorites - and those cookies, i need to make them PRONTO! i love jane austen (english degree holder right here! )- i'm going to HAVE to check out those DVDs! thanks, River! what awesome gifts! see you soon - feel energized - and i hope all your birthday wishes came true! Oh Happy Hoppy Birthday River!! I've been meaning to try those Burgers for a while now - must stop procrastinating and get on with it. I've kinda lost a bit of my mojo so I'll be happy when I get it back and get back into the swing of things. Lost in Austen sounds right up my street - I will have to check it out. I've just gotten into Grey's Annatomy at the moment (up to date on Lost and Heroes and was searching for something else online to watch)it has suckered me right in and I LOVE it. Those Potato wedgies looks so scrummy it all does - as always. And I would be the first to join your goat adoring cult - hee hee hee. Happy birthday! I just celebrated one too so I presume you are a Pisces as well? I love this extra long post although it makes it hard for me to decide what to comment on first. All your presents look lovely and you are lucky to have so many great and thoughtful readers. I also cannot believe you didn't have Veganomicon. Well, I don't have it either but check it out incessantly from the library. I will have to add those cookies to my "to make" list as they look outstanding. Happy happy happy belated birthday my dear! Happy Birthday!! I'm sorry about the fatigue, but you've got a good attitude about it :-) and that package is incredible! Happy belated birthday. Hope your day was wonderful, and that you feel better soon! I am so impressed that you do all that yummy cooking without any cookbooks! happy birthday river! maybe you are tired from all that fabulous cooking you've been doing-- those potato crouton things look AMAZING! and the cookies- YUM! which Austen book is your favorite? i've only ever read sense and sensibility. HAPPY BIRTHDAY, RIVER!! I'm so jealous of your Allison's Gourmet box. I've been wanting to try her goodies for a long time. The fact that they're from VeggieGirl makes them ultra-special. Enjoy them! Good for you for spoiling yourself, too. 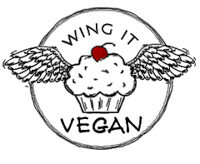 I'm so excited that you get to watch your show and enjoy the Veganomicon goodness. Hooray for your new watch and DVD player from Mr. Wing-It! I hope you're feeling better soon. Happy, Happy Birthday, River! You got awesome gifts! Happy birthday! Those Chocolate-chocolate chip cookies look delish! Happy birthday! Even though it is late, I am still catching up on my blogs. Hurrah for Google Reader! I am glad there were so many fabulous gifties for you. It sounds like a wonderful haul. I have to go and get Lost In Austen. It sounds ridiculously awesome and just my thing. Birthday hugs and kitten snorgles! Happy Bithday to you! Glad it was so fun and you felt loved. You deserve it! I am sorry I missed your actual day. I have been yucky sick!! 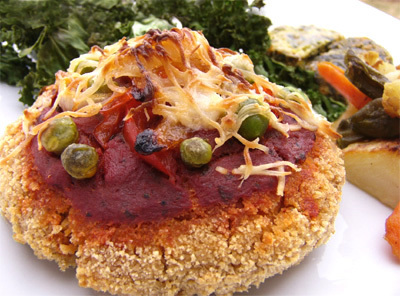 I hope you love veganomicon in a "I liked this recipe and tried it THIS way.. sort of way.." Its a great cookbook but wont hinder your creativity. When is your vegan birthday? Maybe I wont miss that milemarker?? Thanks for all the wonderful things youve added to my life these past months.. I hope this next year is filled with great things added to yours! Happy belated birthday! What wonderful gifts from friends and family! HAPPY BIRTHDAY River! Will you send me your mailing address? I am making you a late birthday present. Hope it was happy. Yay happy birthday River! the cookies look great and I agree - all soup should have potato wedges in them!! awesome. Sorry you've been feeling sucky - hope you're all better soon! Thank you everyone for the birthday and get well wishes! Catherine, sorry about the delay in replying. I bought the DVD from ebay UK. Shipping was only about $7 to the US and it took about a week to get here. Here's a 30 second promo of the show that I found on YouTube if you want to check it out before you buy it. There are other clips of the show on YouTube too. Anyway, here's the promo. Happy Birthday, River! Your giant potato croutons are awesome and I'm so happy that the people who care about you helped the transition from twentysomething to dirty-thirty - wahey!!! Happy Belated Birthday!!! You're going to love VEGANOMICON! Which I think is THE best vegan cookbook out there. Happy birthday River! Thanks for sharing all the good b-day feelings - looks like you had a great day. Is there anything better than a surprise delivery like that - all of those cookies and sweets look fabulous. I hope that you start feeling better soon. If not, then going to the doctor is a good idea. sorry to hear that you're feeling tired lately. Hopefully everything is ok and you perk back up. I'm happy that you had a great bday w/ lots of love and presents. I love the watch! Happy belated birthday! I hope you feel much much better soon though, being tired is no way to celebrate a birthday! However, your chocolate cookies look delicious, as does the amazing gift basket, I am so jealous! Happy Happy! I hope you're enjoying Veganomicon, it's my fave! Wow, VeggieGirl hooked it up on the birthday treats. How awesome! Sorry River, I am so late! Happy belated birthday. Seems like you had a great day. Your pictures are amazing, especillay those of the cookies. I almost got into sugar shock mode just by looking at them. Thank you for sharing all your presents with us. river, i haven't been on much lately, but happy late birthday!!!! it sounds like you had an amazing day. the box of deliciousness looks too good for words!!!!! and i love your watch!!! i had a watch obsession a few years back because i would break mine all the time. i must've went through 6 watches in one year. What happens to be on TV tonight? Lost In Austen! I'm very happy I checked the TV guide. I'm on call thought. So I really hope the on call phone doesn't ring! Happy Birthday! What an awesome spread you got there! Happy Birthday! That looks like quite the loot :) Wow! holy crap, I think I never left a comment to wish you a happy day! so here is one way, way, way belated happy birthday wish for you, dear River. Happy birthday River! Wonderful day to you. I wish you the happiest year ever! And good luck cultivating members for your goat club - sounds great. Count me in. Super great movie - I am ordering it RIGHT NOW!!!! Love love love austen. Feel better and good luck on your energy hunt. Happy Belated Birthday! I have never heard of this DVD now I am dying to get it! Those chocolate chip cookies look fantastic!! !